The picture shows the Sun Cinema, which was at the corner of Brewster Road and Leech Street. This picture was taken around 1985 – before the cinema was torn down. The cinema was built by Stark and McNeil, in 1917, for Leong Eng Khean (the first son of Towkay Leong Fee). 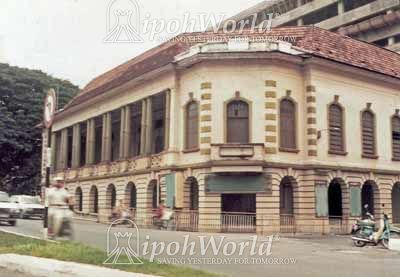 It was originally called the Oriental Cinema which from 1910 to 1917 had been sited in the leased Harima Hall in Anderson Road. The new building in Brewster Road continued as the Oriental until it was leased out to Run Run Shaw (of the Shaw Brothers fame) in the 1920s. The Shaw brothers renamed it Sun Cinema. The Sun Cinema was initially managed by Ho Ah Loke. It became the first cinema in Ipoh to show the “talkies” – which were movies with sound. The “talkie” movie ‘The Rainbow Man’ was shown on 24 November 1929, using a travelling movie company. Inspired by the success, Ho Ah Loke had his own equipment installed. Thus by 1930, the Sun Cinema was the most modern “talkie” theatre in Malaya! Ho, an innovative manager, visited Singapore and obtained the rights to screen American movies in Ipoh – movies such as ‘Love Parade’, Sunny Side Up’ and ‘The Taming of the Shrew’. Later, British movies were also shown at Sun Cinema. In October 1932, Sun Cinema screened its first Malay “talkie”, titled ‘Dasima’; which had a cast of Malayan beauties as well has catchy kronchong music. Sadly, by the 70s, the Sun Cinema began to ‘fade’ as other cinemas became more popular. In 1983, word was out that the cinema was to close down and was to be replaced by a multi storey complex. This never took off and in 2010 the plot is an ugly car park. In the picture we have, notice that a multi-storey complex, Maybank, is however being constructed (in the background). To read a press cutting about Sun Cinema, click here. To know more about Harima Hall, click here. To read more about Towkay Leong Fee, click here. To read more about Leong Eng Khean, click here.